The US space agency, Nasa, is marking the 40th anniversary of the launch of Apollo 11, which took into space the first astronauts to walk on the moon. 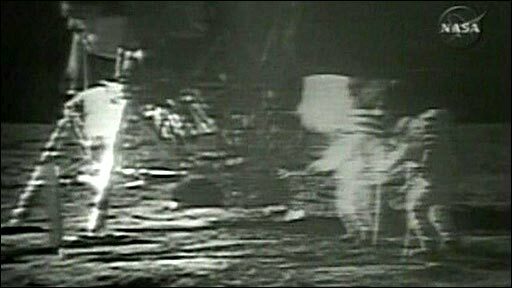 At a news conference, it revealed newly-restored footage of the moon landing, including Neil Armstrong's first step onto the lunar surface. The film was restored by a Hollywood company, which had already spruced up films such as "Citizen Kane". Other Apollo 11 events include a concert and a free "Moonfest". 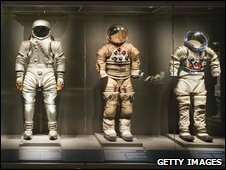 Former astronauts are at Cape Canaveral in Florida - from where Apollo 11 took off - and will visit an exhibition about the Apollo missions, which includes a rare collection of space suits. The lunar footage, screened to journalists in Washington, is part of a $230,000 (£140,000) restoration project. The four selected scenes showed Neil Armstrong and then Buzz Aldrin stepping on to the lunar surface, the astronauts putting up a commemorative plaque and the raising of the American flag. The original footage was filmed by a video camera on the lunar module, in a non-standard format which US television channels could not use. It was beamed back to earth, and then converted into a TV-friendly system. But this badly degraded the images. The space agency says it probably deleted the original footage in the 1970s and 80s, when it had a tape shortage and needed to reuse them. So engineer Richard Nafzger and his research team spent three years searching for copies worldwide. He found footage in Australia and at the CBS television studios in Houston, as well as reels of tape in Nasa's own huge archive vaults, which had not been viewed for 36 years. The Hollywood company, Lowry Digital, is restoring two-and-a-half hours of the material. Nasa expects to release the full version in September.